This is the time of year to get your fill of Asparagus and I seem to be using it in almost every meal I make just lately. You know it is spring when these funny looking veggies make their appearance at the super market. Only young asparagus shoots are commonly eaten: once the buds start to open (“ferning out”), the shoots quickly turn woody. Asparagus has been used as a vegetable and medicine, owing to its delicate flavour, diuretic properties, and more. It is pictured as an offering on an Egyptian frieze dating to 3000 BC. In ancient times, it was also known in Syria and in Spain. Greeks and Romans ate it fresh when in season, and dried the vegetable for use in winter; Romans even froze it high in the Alps, for the Feast of Epicurus. 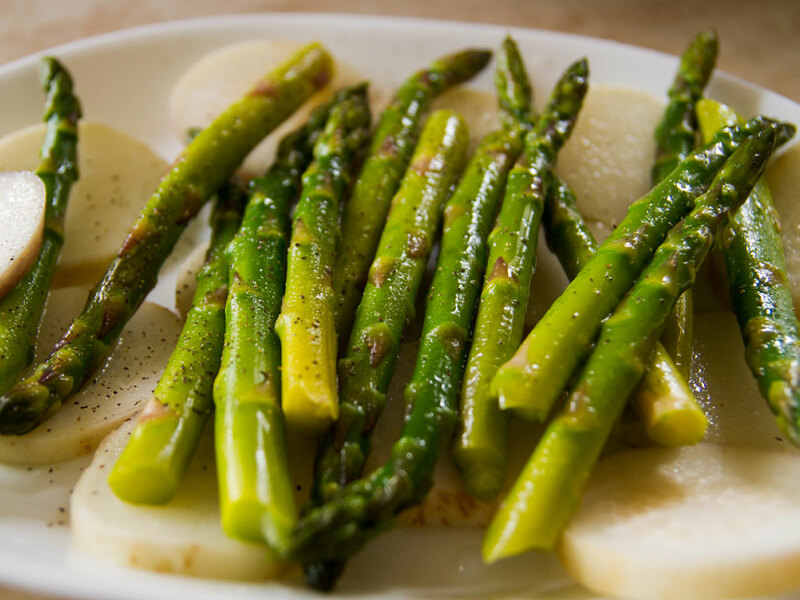 Water makes up 93% of asparagus’s composition Asparagus is low in calories and is very low in sodium. It is a good source of vitamin B6, calcium, magnesium and zinc, and a very good source of dietary fibre, protein, beta-carotene, vitamin C, vitamin E, vitamin K, thiamin, riboflavin, rutin, niacin, folic acid, iron, phosphorus, potassium, copper, manganese and selenium, as well as chromium, a trace mineral that enhances the ability of insulin to transport glucose from the bloodstream into cells. The amino acid asparagine gets its name from asparagus, as the asparagus plant is relatively rich in this compound. I cooked this salad with a lovely fresh tuna steak but not everyone in the house is overjoyed with tuna so I made sure I have a few chicken breasts for the picky eaters. That suits me just fine as there was more for me! There are 19.5g carbs, 24.4g protein and 5 Weight Watchers points per serving. For the tuna steak, heat a griddle pan until hot. Add the agave nectar, vinegar and 1/4 cup of water. Add the lemongrass, chilli, mint and coriander. Cook for a couple of minutes until sticky and then roll the tuna in the glaze and cook till light brown. Make sure it is pink in the middle. Removed from the pan, brush the remaining glaze over the tuna and allow to rest for a few minutes while you make the salad. 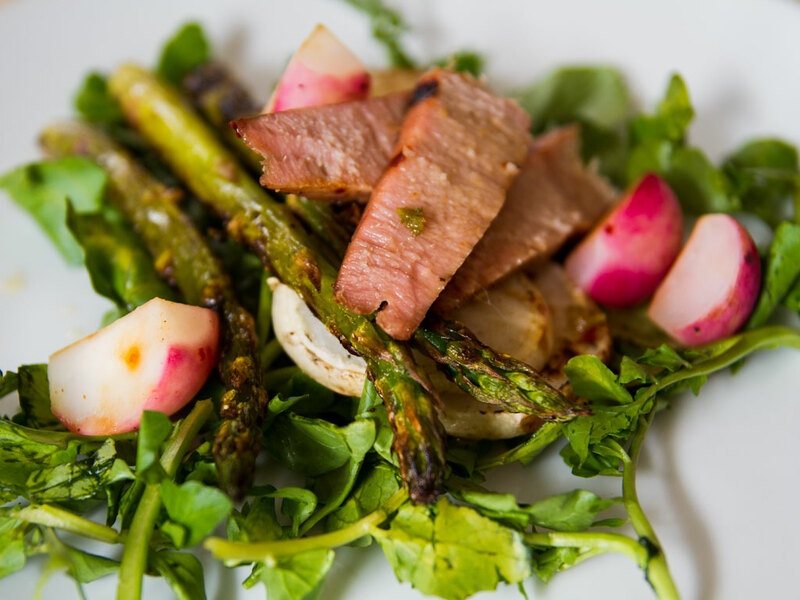 For the asparagus salad, heat a saucepan of boiling water and blanch the asparagus, radishes and turnips. Drain. Place the vegetables in iced water to refresh. Fry radish in a heated skillet till soft. Place the watercress, mint and coriander leaves in a large bowl. Add the grilled and fried vegetables and mix it all together. To serve, cut the tuna into bite-size pieces and serve over the salad. Garnish with coriander. Drizzle remaining glaze over salad and serve immediately.